Intensive skin rejuvenation and cleansing therapy that works deep underneath the skin layers making it visibly free from impurities, improving skin elasticity and ensuring a healthy glow. 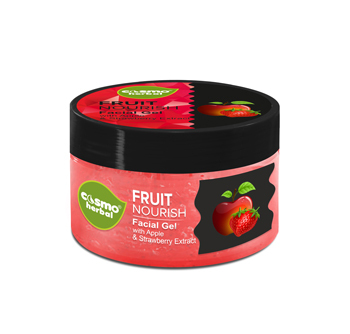 Enriched with Apple and Strawberry extracts, it is a fruit bomb that penetrates deep into the skin layers and removes impurities, toxins and dead cells. In the process, it also helps in improving blood circulation, skin elasticity, skin cell rejuvenation and thus removing visible signs of ageing. Apple is an invigorating solution for toning and moisturising the skin. When used as one of the prime constituents in a skin care gel, a supple, soft and velvety smooth effect on the skin is very much expected. As you age, your skin gets prone to wrinkles followed by a loss in moisture and natural tightness. To retain that natural moisture we offer Aloevera based face gel that comes enriched with aloevera extracts essentially required to keep the skin hydrated. Furthermore, it also helps in slowing down the ageing process by improving the strength of skin tissues. Aloevera is an effective remedy for maintaining skin moisture from deep within the pores. When used as a facial gel, it helps in removing the waste skin debris and wrinkled spots, thereby giving a glowing look. 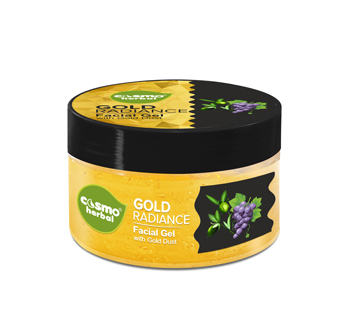 Enriched with Gold Dust, the Gold Radiance Facial Gel is a refreshing alternative for skin cleansing and rejuvenation. Its active mechanism proves highly effective in removing toxins, waste and dead skin cells, yet it stays gentle and harmonious on the skin. Periodic use works wonders in imparting a bright glow to the face with visible reduction in wrinkles and skin ageing. Essential ayurvedic material for centuries, Gold gives the skin a luxurious treatment. Highly ideal to aging as well as dry skin, the gold based gel solution tones, purifies and rejuvenates from within.